One of the greatest luxuries of working from home is the ability to fit in baking around my sewing….weekends tend to be filled with chores, grocery shopping and if the weather is nice a walk over the marshes or through the woods, so pottering and poodling in the week means I can bake with no distractions. 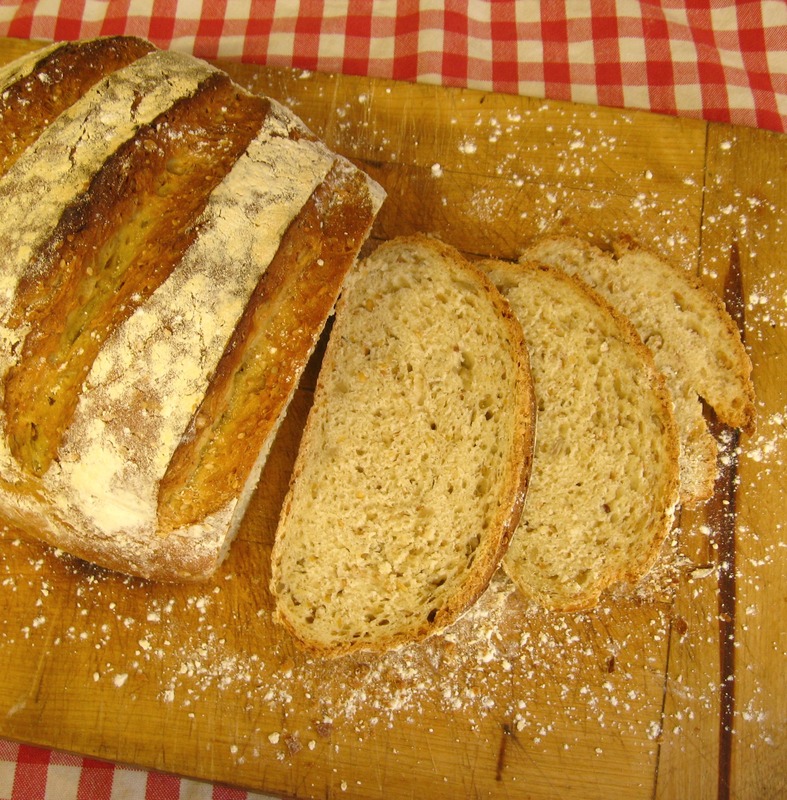 I’m lucky to have a friend (the delightful Miss Daisy) who is a wonderful cook (she’s off to the prestigious Leith’s Cookery School in September) and last year she gave me a sourdough starter which has really changed the way I bake bread. 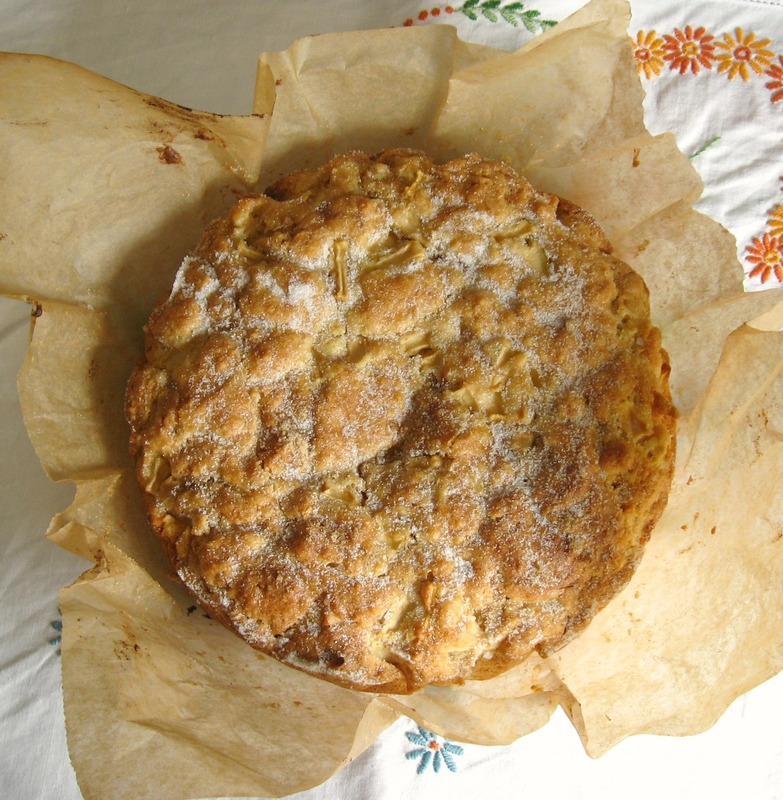 I used to put the dough ingredients in to the Kitchen Aid mixer (one of the best birthday presents I’ve ever had) and the machinery did most of the work for me…..I played about with different flours and ingredients but not to the extent that I have done since I’ve used the starter. I asked her about it last week as she’s making a new one with raisins and she said it was just bread flour and water, nothing fancy. The bread I make isn’t a real sourdough, I cheat by sprinkling a skimpy teaspoon of dry yeast on to the bread sponge, but I find this helps make for a tighter bready crumb, and the bread then toasts better. Over the past year or so I’ve found myself becoming more and more intolerant to grains and grasses so no longer can tuck into fat doorsteps of bread, toasted and covered with salty butter and marmalade, so the bread I bake is only eaten by my boyfriend and has to double as both a breakfast bread and a sandwich one…. (the raisin and rosemary bread from the other week was thumbs up for toast, but not quite so much for sandwiches).. Anyway I liked the thought of a slightly herby tasting bread so this week I made a dough using just the one sprig of rosemary and then a couple of handfuls of assorted seeds (sunflower, linseed and sesame), and used about 200g of spelt flour. It came out okay, maybe a bit denser than usual as I’d been out in the morning and forget to leave the starter out of the fridge to get to room temperature before using it, but it smelt amazing when it was being toasted….and I was assured it made for a very nice sandwich. 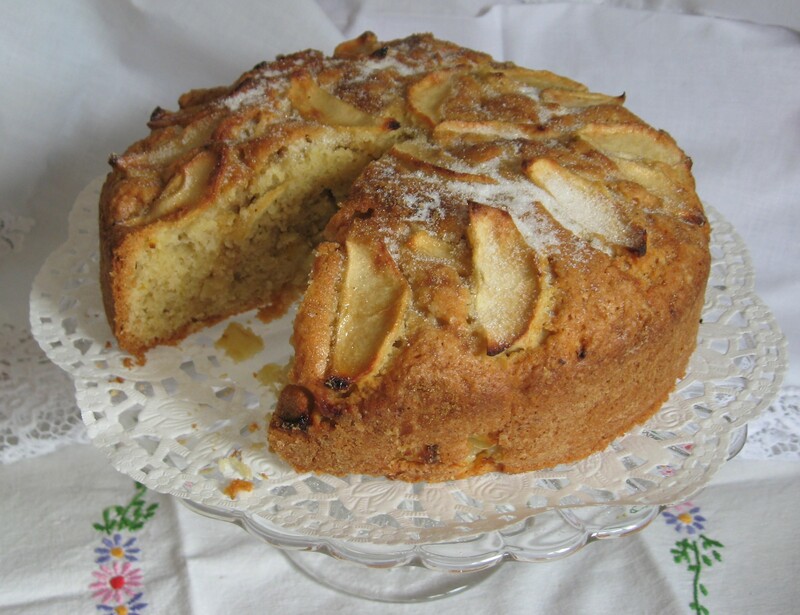 Feeling on a bit of a roll, I then made the beloved one, one of the “Sunday afternoon apple cakes” even though it wasn’t a Sunday and used some rosemary in there too….he didn’t mention it as a flavour so am thinking he didn’t even notice it (before Christmas I bought a huge needlepoint/tapestry picture and re-arranged the other pictures behind the sofa to make room for it…not a peep has been heard so sometimes things get by quite un-noticed, but if there is a pin on the floor …well my own personal “Colin”* will see that alright)………….along with the rosemary I also used ground mace and a couple of heaped desert spoons of ground almonds. There was a grumble when I said I’d baked a cake (he’s trying to “cut down” apparently) however it lasted maybe 3 days, as a packed lunch treat and as a pudding, so figure it was okay. Me and the delightful Miss Daisy were also discussing the awesomeness of beetroots (I love them, she’s not such a fan) but I told her how they make for a brilliant cake…sadly they don’t turn a sponge cake that beautiful clarety pinky purple (like the edge of your plate when you have them in salad) but more imbues them with a gorgeous ruddy wholesomeness….this is one of my favourite cake recipes for them (the boyfriend won’t normally eat them but I can hide them in cake) but I also find they work really well in my “Crikey that’s nice Carrot Cake” recipe..(just substitute the carrot with a beetroot), but the icing needs to be lemony to really be perfection itself. *from The Great Escape…one of my favourite films of all time, I can’t watch it without bursting into tears as Dany and Willie row away in that little boat….in fact just thinking about that scene has made me tear right up ….oddly Colin used to scare me a little when I was small, now I love him to bits and his scenes with James “The Rockford Files” Garner are easily some of the best bits……not forgetting “Good Luck”.”Oh, Thank you”…doh. Last weekend it was my sweeties birthday and there was a request put in for birthday cake…..most years I make a chocolate cake but of late our oven has started playing up (we really need to get a new one) and about the only cakes that seem to come out nicely are slow baked light fruit ones or a Sunday apple cake…..
Everyone agreed it was very light , more so than normally and it certainly felt moister when I was cutting it for driving home snacks the next day. The cake lasted a few more days as evening pudding (I’m not sure it even got to touch the sides of the beloved one’s mouth…one blink and the cake is gone)….. I used ground mace as I wanted it to have a nice fresh citrusy taste and the mace compliments the lemon zest really well, though in the past I’ve used cinnamon and a little star anise……it’s always tricky for me to judge because I don’t actually like this cake (cooked apple makes me pull those faces children make when eating sprouts or broccoli) but it’s one of the sweeties all time favourites* so I’m always quite happy to make it for him. *this gets picked more frequently than a chocolate cake so I guess it must be okay as he is a complete chocolate fiend! Preheat your oven to gas 5, lightly butter a 20cm spring-form cake tin, put in a circle of baking parchment and then flour the sides. Sift the flour, baking powder and ground mace into a large bowl. Try not to use too much of the spice as you want to be able to taste the apple. Dice the unsalted butter into cubes and then rub it into the dry ingredients. It sort of looks like fattish breadcrumbs. Stir in the sugar and the lemon peel. Peel and core your apple. Chop the apple up into small pieces and add them to the flour and butter. Lightly beat the two eggs and then stir this into the cake mix using a fork. Spoon in to the prepared cake tin and gently level the surface with the back of the spoon. Bake in the oven for 40 – 45 minutes until springy to the touch. Test with a wooden cocktail stick to check that it is cooked inside. It is a moist cake so a little will stick but if you need to give it a little longer then it should be none the worse for it. Allow to cool for a rack for a few minutes before easing around the sides with a metal palette knife. Open the tin and then gently ease the cake off the bottom section, again with the aid of the palette knife. Sprinkle a little caster sugar over the top before serving. Ideally this needs to cool for at least half an hour but if you are careful you should be able to cut it with a sharp knife after 15 minutes. 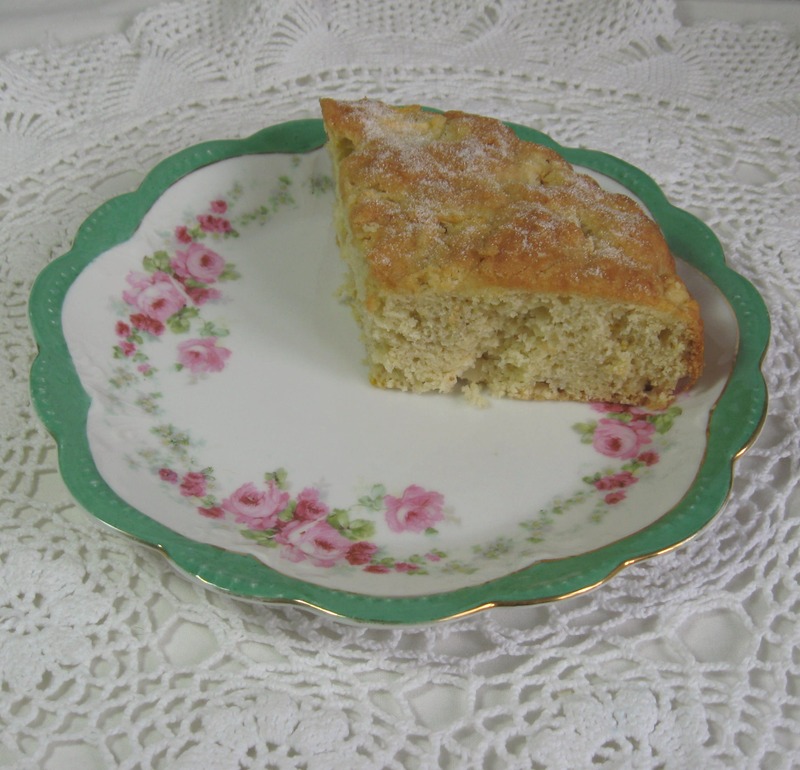 This cake is really simple, it’s quite old fashioned and is the sort of recipe that you can find hand written on butter stained writing paper and folded in cookery books in charity shops. 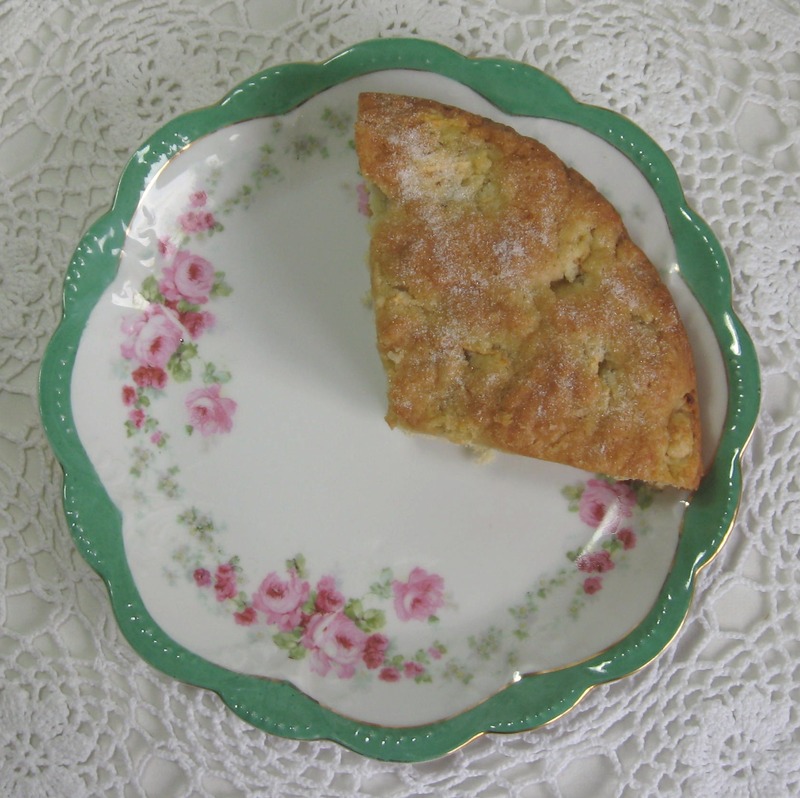 It’s a nice cake for Spring as the citrusy flavours of the lemon peel and ground mace are nice and uplifting. 1/2 tsp of cinnamon or mixed spice or a generous grating of nutmeg. Sift the flour, baking powder and what ever spice you are using into a large bowl. Try not to use too much of the spice as you want to be able to taste the apple. Stir in the sugar and the lemon peel. Peel and core your apple. If you are using one large apple put a quarter of it to one side. Chop the rest of the apple up into small pieces and add them to the flour and butter. Lightly beat the two eggs and then stir this into the cake mix using a fork. Spoon in to the prepared cake tin and gently level the surface with the back of the spoon. 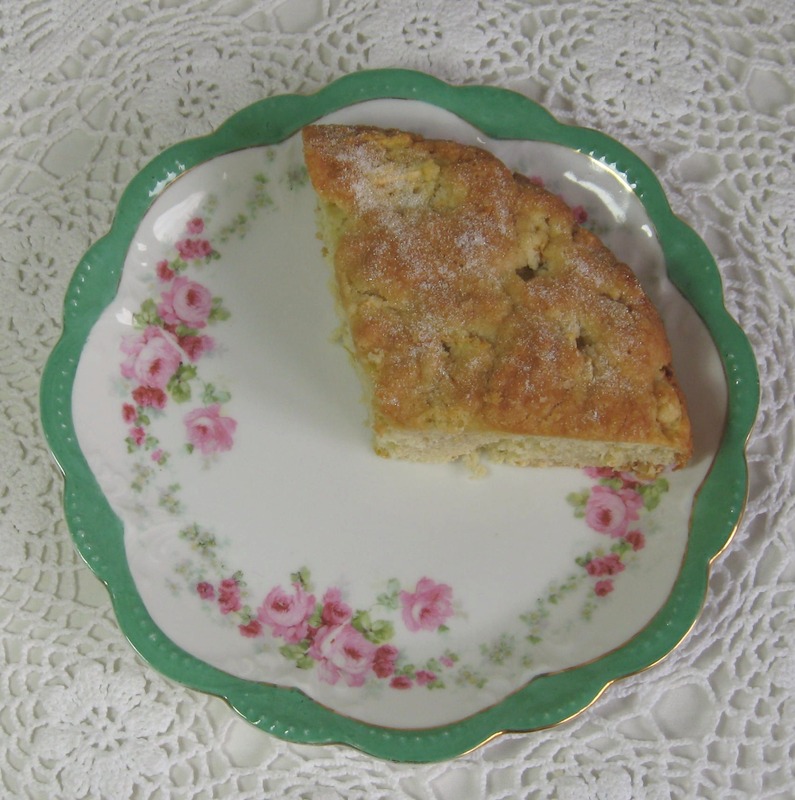 Thinly slice the remaining apple quarter and arrange in a pretty pattern over the top of the cake. Sprinkle over the tbsp of brown sugar (today I used a soft brown sugar as that was the first jar I saw, but I’ve used Muscovado sugar and Demerara sugar before and they both work fine). It’s the cake I tend to make on a Sunday, and it isn’t really a summer cake, so making it I always feel like Autumn is just around the corner. Best enjoyed with a cup of tea, a good book or a Powell and Pressburger film.